For some teams, today will be a final tuneup before trying to make a deep run in the conference tournament. 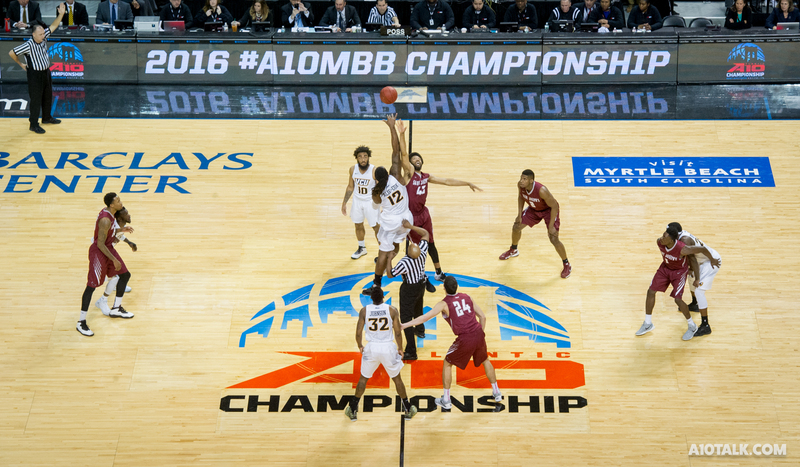 For others, like UMass, Duquesne, and St Joseph’s, it will be the end to a difficult conference season. Regardless, today will be the last of an 18 game A-10 season for everyone, before the do-or-die games in Pittsburgh start on Wednesday. Seeding (aside from Dayton) is still very much up in the air, so every game will be significant in shaping the bracket. Saint Joseph’s heads down to Pittsburgh a little early to play Duquesne in the Palumbo center before taking the quarter mile bus ride to PPG Paints arena for their Wednesday game. Neither of these teams has had their season go to plan. After winning the conference tournament behind Deandre Bembry and Isaiah Miles in 2016, the Hawks have been devastated by injuries, and would have their first last place finish of this century with a loss. The Dukes have had some trouble finding any consistency this season with many new young players. However, Isiaha Mike and Mike Lewis both average over 10ppg in their freshman seasons, and will combine to be a formidable backcourt in the A-10 in the near future. Hawks find a way to end the season with a W, avoid last place, 70-66. In the middle of January, La Salle looked primed to make a bid for a double bye. Now, after a 3-9 stretch, they can finish as low as tenth. Jordan Price’s production has stalled as well, scoring only 17 points on 7-25 shooting in the past three games. While Fordham is in the same territory record wise, the mood is completely different. A win today would mean their second consecutive 8 win season. Considering that in the seven years from ’08 to ’15 they only managed 14 wins, this would be quite the accomplishment for Neubauer’s bunch. Fordham manages to win 8 in conference for the second straight season, 63-60. George Mason has already far exceeded anyone’s expectations this season. For the first time since their entrance to the A-10, the Patriots will not have to play a Wednesday tournament game. They can also snag their 10th win of the season Today, and really make their presence felt, with a big win in The Siegel Center. Either way, GMU has taken huge strides forward this year, and with a solid backcourt returning, and a few recruits next year, could distance themselves even further from the bottom of the conference. VCU still has seeding to play for, as a loss to Mason and a Rhody win would drop them to third. VCU squeaks past Mason, 75-72. Richmond has already sealed up a double bye, and is looking to sneak past Rhode Island into the 3 spot. The biggest part of the Spiders success this season has been POY candidate T.J. Cline, averaging over 18 points and 8 rebounds per game. A 13 win season would be a huge bounce back for a team that managed only 7 in 2016. When the Billikens started the season 0-4, many wondered if they would win a single game. Now, without any of next year’s starting five on the court, they have pieced together 6 wins, and something to build upon moving forward. While many of their starters now may not be in the years to come, they will still be key components in Travis Ford’s future powerhouse. The Bonnies have not been playing great ball as of late. They come out of the gate flat, usually digging themselves into a deep hole that takes them the rest of the game to work their way out of. A lot of this can be attributed to their inconsistency on offense. They rely heavily on the tandem of Jay Adams and Matt Mobley, who while hot have carried the team, have also disappeared for long stretches. The good news for the Bonnies though, is that they play the Minutemen, who they have beaten in 7 out of their last 10 meetings. UMass has had their struggles persist all season, due in part to inexperience from their talented young players, but also due to inept coaching from Derek Kellogg. As I’m sure by now most UMass fans will agree, there have been times this season where anyone watching would think they could do a better job game managing than Kellogg. Kellogg may need some luck if he’s ever going to coach another regular season basketball game for the Minutemen after today. Bonnies win another ugly one at home on senior night, 74-66. From the outside, it seems that every game Rhode Island plays is a must win to stay on the bubble. But Rhode Island continues to lose horrible game after horrible game, and remain in the at-large conversation. At home in the season finale against Davidson is another one for the Rams, as they look to head into the conference tournament riding a five game win streak. However, the Rams, a large part due to horrendous coaching, have managed to play horribly and choke many important games this season. Today feels no different. While Davidson was predicted to be a top-4 team this year, they have stumbled through most of the season, and can at best salvage a .500 record and 8th place finish. Dayton has already locked up first place, and a tournament bid, so Flyers don’t have much to play for today. George Washington on the other hand can still finish as high as fifth and as low as ninth in the standings, so they will be playing urgent basketball for 40 minutes. Even so, the Flyers always play smart, disciplined, and hard basketball thanks to Archie, who has made them the true power in the A-10. Dayton does what Dayton does. Win. 79-63.